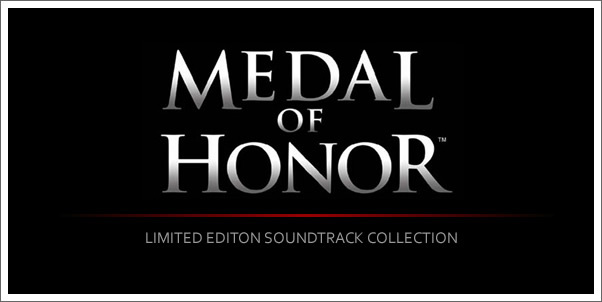 LOS ANGELES, CA – Electronic Arts (EA) continues to make new strides in video game music with the release of the MEDAL OF HONOR SOUNDTRACK COLLECTION. The limited edition eight disc collection includes original scores from the 14 MEDAL OF HONOR titles, previously unreleased material from the award-winning composers Michael Giacchino, Christopher Lennertz and Ramin Djawadi, a 40-page booklet with complete track information, and an introduction by game creator, Director Steven Spielberg. According to Steve Schnur, Worldwide Executive of Music and Marketing at EA, “the box set representing the 12-year-old franchise is an absolute milestone for video game scores. The millions of MEDAL OF HONOR fans around the world deserve nothing less. We are honored to partner with LA-LA Land Records.” The limited edition box set will be released March 1st. In choosing an appropriate composer to convey the mood of the first MEDAL OF HONOR, legendary director Steven Spielberg was introduced to and impressed with young unknown composer, Michael Giacchino. “I did what anybody in their right mind would do,” said Spielberg. “I signed him up to score MEDAL OF HONOR—and the rest of Giacchino’s history belongs to him.” Giacchino’s video game score pioneered live orchestral recordings of videogame music. After four highly successful video game scores, the baton was passed to Christopher Lennertz, who also composed the score for the Quantum of Solace game. Lennertz recorded MOH European Assault and Pacific Assault with the Hollywood Studio Symphony, which has recorded for legendary composers such as John Williams. Last year the game was reinvented and for the first time in its 12-year history, MEDAL OF HONOR left World War II and entered the modern day warfare in Afghanistan. The most recent disc of the collection demanded an intense score that could bring the game into this brand new era, and Ramin Djawadi was brought on for the challenge. Known for his score for Iron Man and the Prison Break television series, Djawadi’s score matches the intensity of the soldier’s story and Tier 1 experience in 2010’s MEDAL OF HONOR. Search Amazon.com for "Medal of Honor soundtrack"